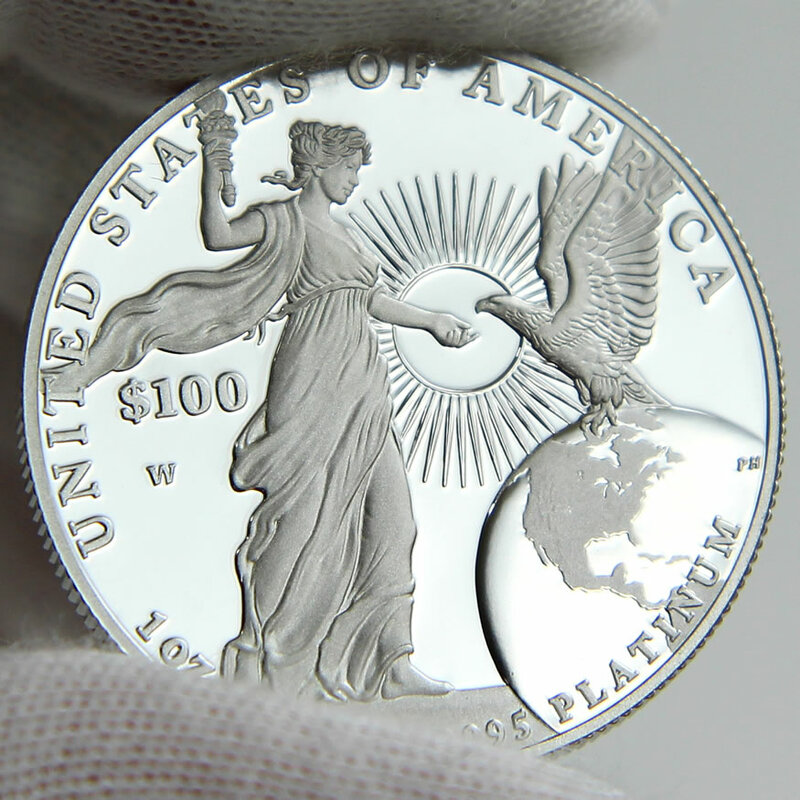 With only 4,000 available, the 2015 $100 Proof American Platinum Eagle sold out within minutes of launching on Thursday, Dec. 3. We managed to get one. 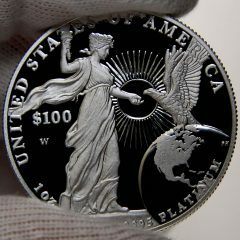 This article presents photos of the one-ounce, 99.95% fine platinum coin from the West Point Mint. I like this Platinum Eagle. It’s a keeper. The reverse stands out. The frosted design elements of Lady Liberty, the raised walking surface, the bald eagle and the North American continent pop against the mirror-like aspects of the coin’s background and jutting image of the rounded earth. The circular rays gleam differently depending on lighting with sections of them seeming to synchronously rotate like a second hand on a clock. 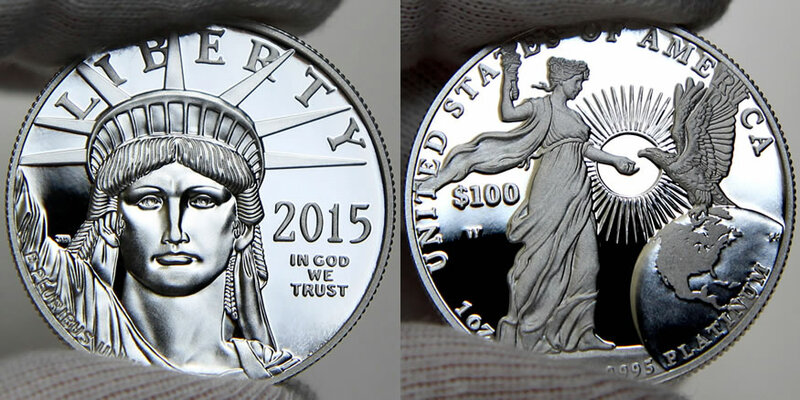 Shown are the obverse and reverse sides of the 2015 American Eagle One Ounce Platinum Proof Coin. The obverse, designed and sculpted by John Mercanti, has remained unchanged since the platinum series debuted in 1997. 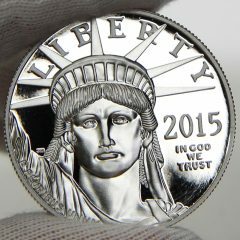 Reverses of the proof coins change each year. 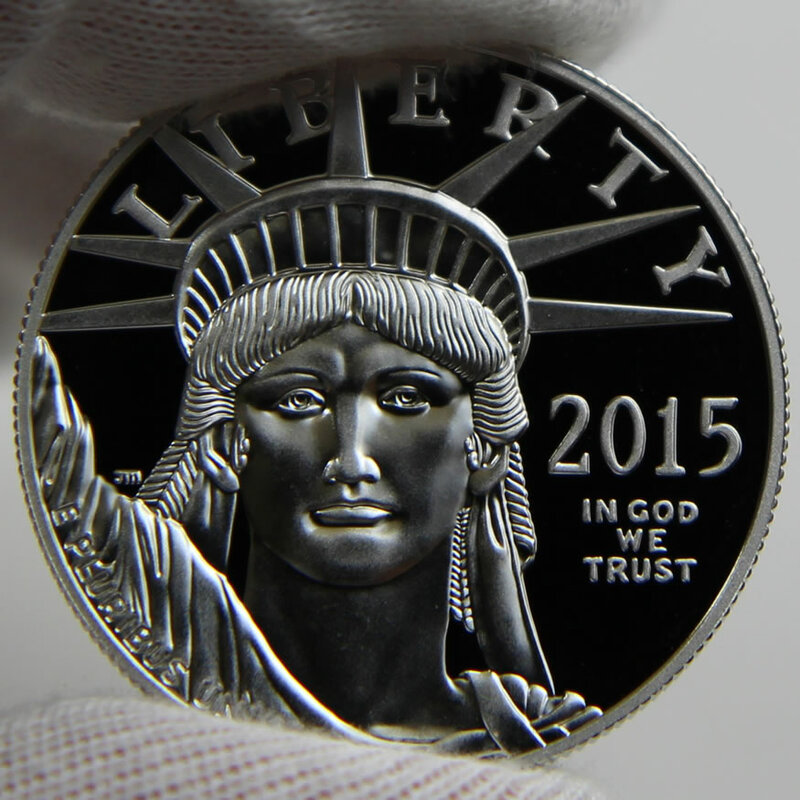 This year’s reverse was created by Joel Iskowitz and sculpted by Phebe Hemphill. 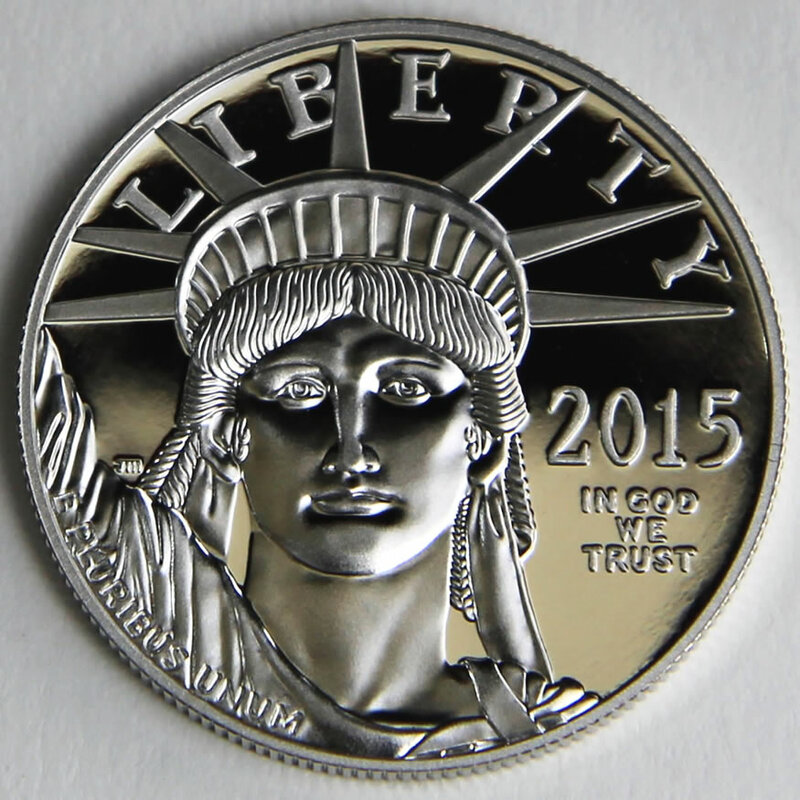 Entitled ‘Liberty Nurtures Freedom’, it’s the first in a new two-year ‘Torches of Liberty’ series that features designs representative of liberty and freedom. For me, a keeper means I’ll enjoy this coin for a few more days and then it’ll find its way to a safe deposit box for longer term storage. Its presentation case, however, will likely get thrown. I actually think it’s very well made — one of the better ones I’ve seen from world mints. It’s more compact than the hardwood cases used by the U.S. Mint for gold coins and the quality is solid. I’m just not into storing coin cases because the number of them gets crazy the more years you collect. Without further ado, directly below are more photos of the coin from different lighting angles. Keep in mind that they don’t come close to showing how good one looks in your hand. First, here are large photos of the proof Platinum Eagle’s obverse and reverse. Here are more photos of the reverse. 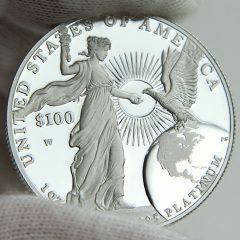 Here are more photos of the obverse. 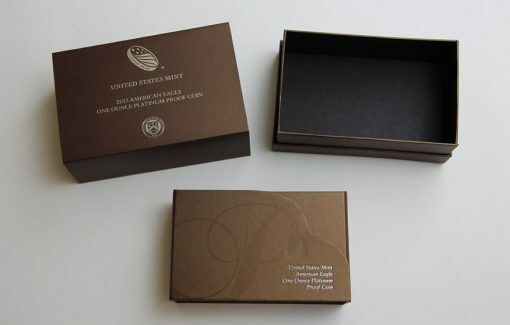 Finally, here are photos of the coin’s brown presentation case, outer box and documentation. The middle cushioned section of the presentation case is reversible. The other side can hold two coins. Since the ‘Torches of Liberty’ series lasts two years, collectors could use the second spot for next year’s coin. Thanks for sharing photos of your “platinum beauty” which is what i call mine. Don’t throw away the coin presentation case Mike! There is a company in Florida that actually purchases & sells empty original Mint coin packaging. It is the OGP (Original Government Packaging) division of John Maben Rare Coins company which owns ModernCoinMart also. 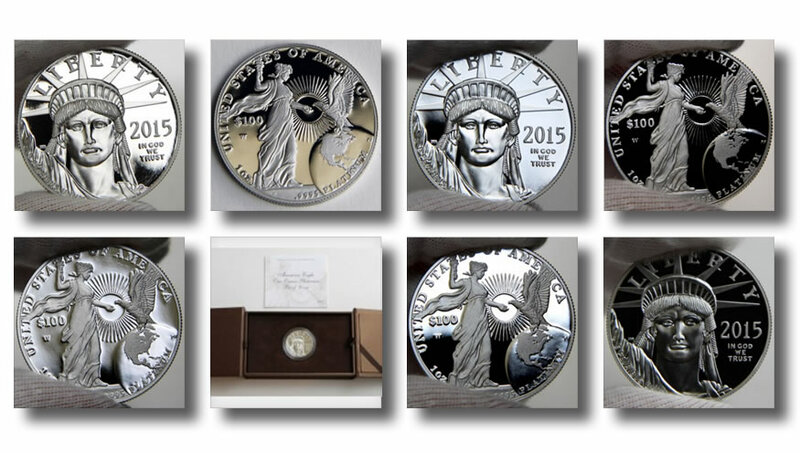 There are some early U.S. Mint commemorative coin packaging mostly from early silver half dollars that sells for more than high-grade coins themselves. The top expert on U.S. commemorative coins, Anthony Swiatek (known as Mr Commem) has actually sold one such original Mint packaging for $3,000 ! Just remenber, there are collectors who will buy anything related to numismatics. Thanks for sharing the high quality photos. 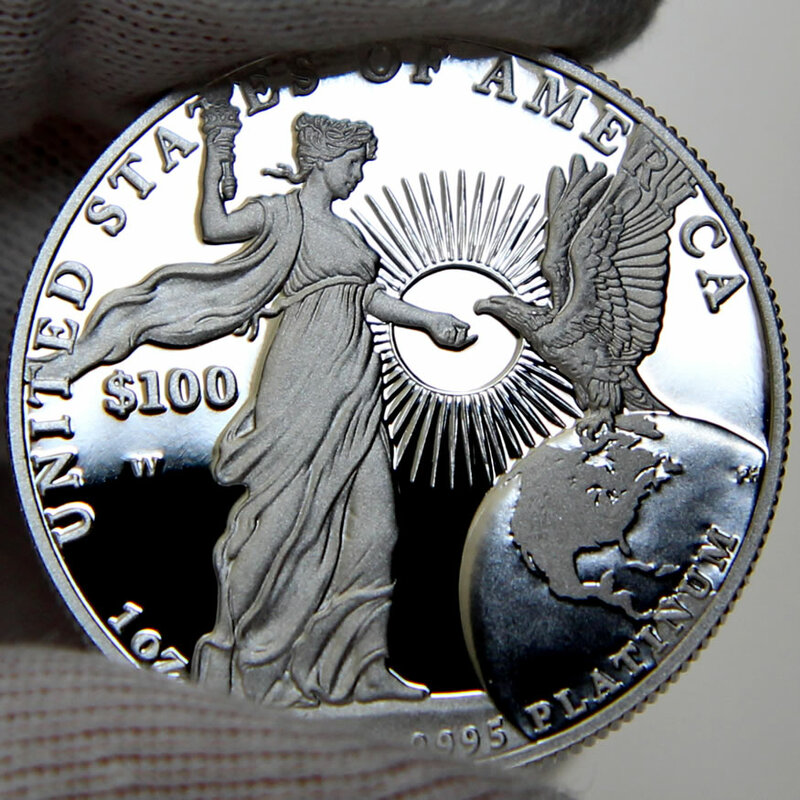 I’m so jealous… I will have to buy it on the secondary market now since the mint swindled me. Enjoy and congratulations to those that were lucky enough to get one! On ebay so far the highest price sold via Buy It Now for an unopened box of a U.S. Mint 2015-W Platinum Proof 1 troy oz. 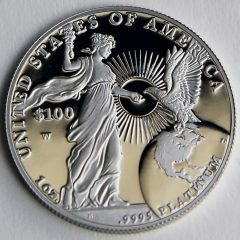 $100 Coin was $2,499.99 for item #262181723000 from Seller: brendancoinguy yesterday morning Tuesday December, 8, 2015 @ 08:32 AM PST. 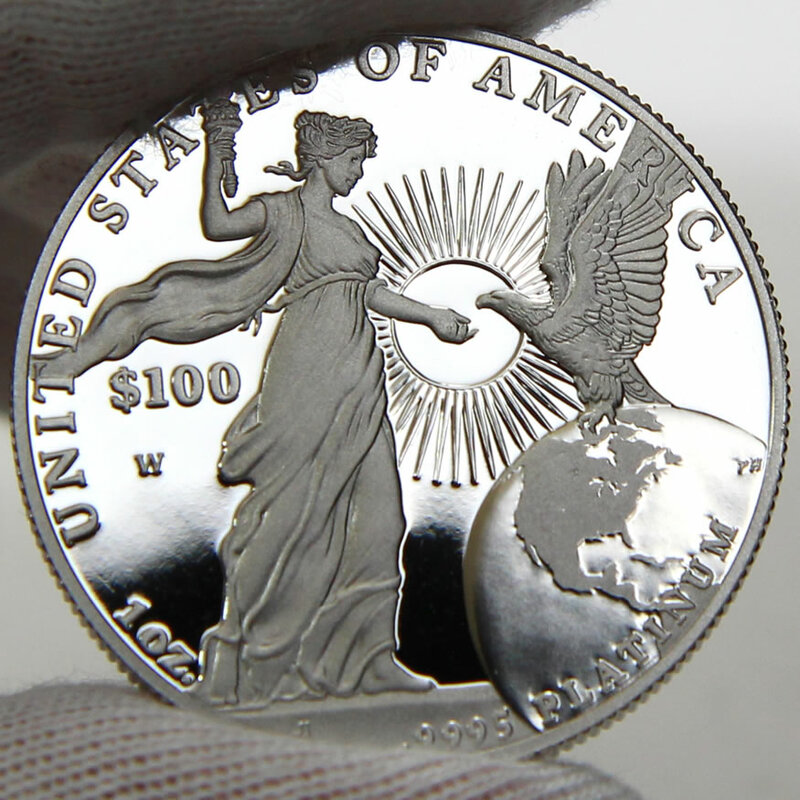 Since this coin cost $1,200, this means $2,499.99 – $1,200 (cost) = $1,299.99 Profit. $2,499.99/$1,200 cost = 108.3% Gain after just 5 days. 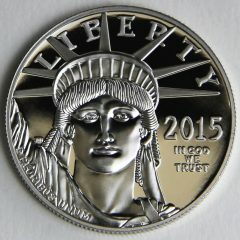 Another example of why the mint should offer a discount to those who wish to buy the coin alone without all the fancy packaging. 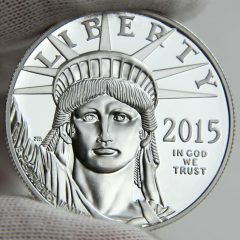 Mike, could you please photograph the other side of the insert to reveal the two-hole openings for the 2015 and 2016 coins? Thanks. Great photos. One correction, the date under the obverse photo should read 1997. Mine actually came with a 5 in x 3 in brown felt cloth besides the box etc. Any one else have this as well? I added another photo that shows the flipped side of the case’s cushion with the two openings for coins. I also corrected the caption date. Thanks! Thanks Mike, for the additional photo of the two-hole opening. 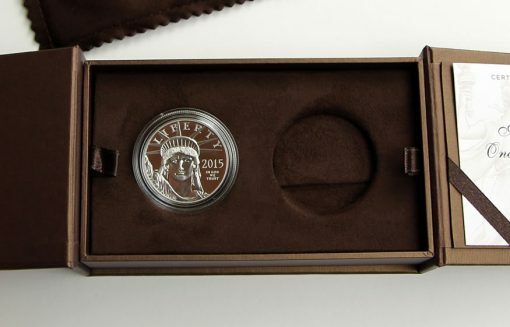 I wonder if next year’s coin will have an option of coming in a box and sleeve with wording that indicates the two-coin set, as the wording of this year’s box and sleeve is in the singular tense.and only has the current year “2015”. Since the limit for 2015 was 4,000 and will probably be more in 2016 the 2 hole side won’t be of any use for those >4,000. I know Canada on occasion will separately sell a special presentation case for coins of a set issued in different years. 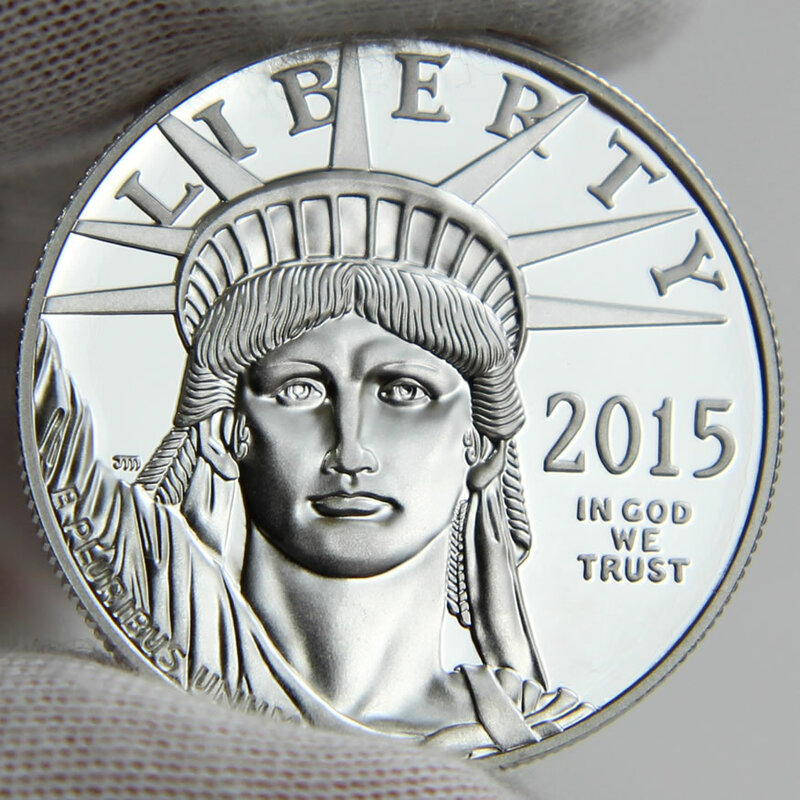 The US Mint could have done something similar for those 4,000 anyway. 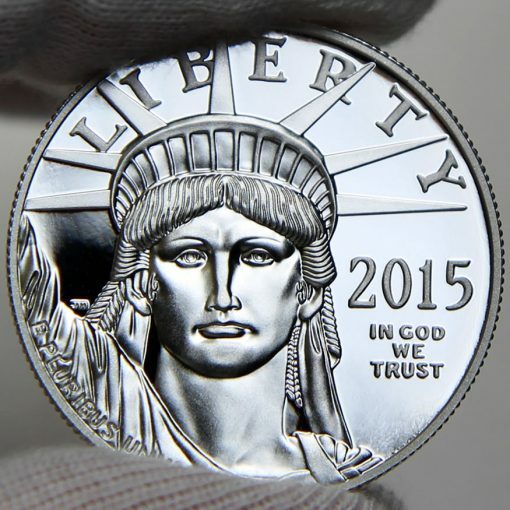 I’ll bet the 2016 coin will be in a similar case, singular text, and only “2016”.